My Yesterday’s Demons page contains a sample chapter, character introductions, and purchasing links. This month marks the one-year bookaversary of Yesterday’s Demons! My debut novel was published in eBook on April 12, 2016, and the paperback edition followed on April 22, 2016. I’ve mentioned many times before how the publication of my novel was a dream come true. Even one year later, it’s just as thrilling as the first day I saw my book — my book, you guys, omigosh I wrote this — listed on Amazon.com. 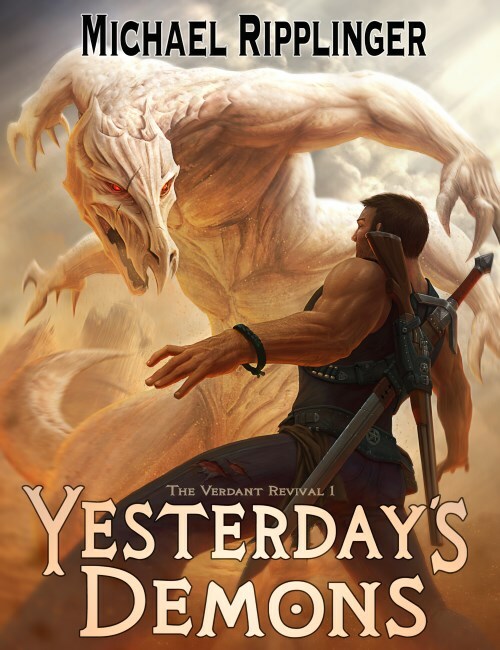 If you haven’t read it yet, visit my Yesterday’s Demons page for a sample chapter, character introductions, and purchasing links. If you like YA-friendly fantasy or JRPGs like Final Fantasy and Phantasy Star, you’re going to love it. And since a bookaversary is grounds for a celebration, I think it’s time to hand out a little treat. It’s been a long time since I dropped any hints about the next book in The Verdant Revival trilogy, Tomorrow’s Shepherd, and according to my Project Tracker, the second draft of that book is now 21% complete! Besides the book’s title, I’ve previously mentioned that the book would focus not on Siv (the protagonist of Yesterday’s Demons), but on Siv’s friend Fritz. The Verdant Revival features three main characters — Siv, Fritz, and Cassie — and the three of them take turns being the main character. That’s all the hinting I can give you for now. I’m only 21% done with the second draft, after all. But I can’t wait to get this one into your hands.